The Eagles traded back in 2018 and still ended up with a good player in Dallas Goedert. Heading into any draft, there are always arguments to be made about trying to trade up for a better prospect, trading back and acquiring more draft picks, or just staying put at your spot and picking a player. • Traded up (6 times): Jerome McDougle, Shawn Andrews, Jeremy Maclin, Brandon Graham, Fletcher Cox, and Carson Wentz. McDougle: The only bust of the trade up group, largely because he got shot. Andrews: Stud RG for a few years, then he got his Michael Phelps on. Maclin: Developed into a very good starting receiver, had 1,300+ receiving yards the year before bolted for Kansas City in free agency. Graham: Highly criticized pick for years, but Graham became one of the best players on the team, and a Super Bowl hero. Wentz: NFL MVP until he tore his ACL. Still has elite potential. • Traded back (4 times): Kevin Kolb, Trevor Laws, and Marcus Smith. Kolb: In his first game as "the guy," he was pummeled by Clay Matthews and lost his starting job to Michael Vick before being dealt to Arizona. The Eagles selected Kolb, Stewart Bradley, and C.J. Gaddis with the picks acquired from Dallas in that trade. Laws: 45 career tackles and five sacks in an underwhelming career. 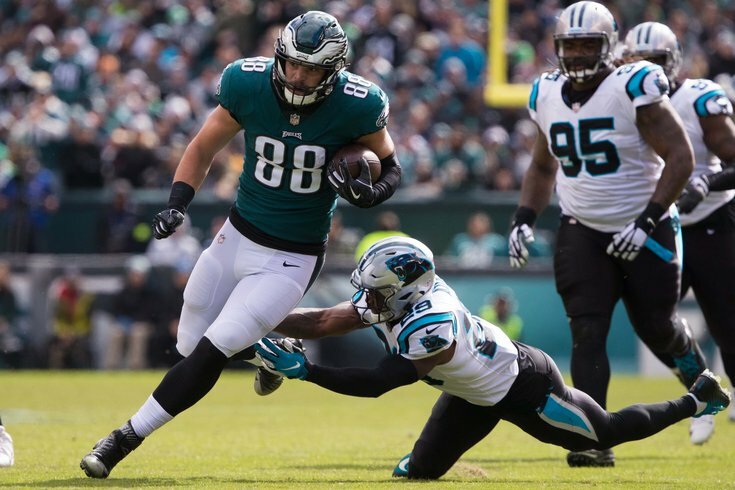 However, this trade netted Laws, Mike McGlynn, Quintin Demps, and Carolina's first-round pick in 2009, which the Eagles then traded along with a fourth-round pick and a sixth-round pick for Jason Peters. I'd say that trade worked out. Smith: By moving back four spots and selecting Smith, who is already a bust, the Eagles also drafted Jaylen Watkins and Taylor Hart. Goedert: By moving back 20 spots from 32 to 52, the Eagles were able to pick up a 2019 second-round pick. They also moved up seven spots in the fourth round of the 2018 NFL Draft as part of the deal. They then traded up from 52 to 49 with Indy, giving up a fifth-round pick to select Goedert, who already looks like a complete tight end in the NFL. • Stayed put (10 times): Donovan McNabb, Corey Simon, Freddie Mitchell, Lito Sheppard, Mike Patterson, Brodrick Bunkley, Danny Watkins, Lane Johnson, Nelson Agholor and Derrick Barnett. McNabb: Franchise QB for more than a decade. Simon: Impact player early in his career, declined rapidly at around 27. Mitchell: Made one huge play, talked like he was an All-Pro. Sheppard: Quality starting corner for years, although like Simon, he too declined rapidly at around 26. Patterson: Meat and potatoes guy on the interior of the defensive line. Decent career for a late 1. Bunkley: Imposing interior defender, did not live up to vast potential. Watkins: This was the stupidest pick the Eagles made over the last 20 years. He was freaking 26! Johnson: Great pick in a weak draft class. Agholor: Bust for two years who broke out in year three with the team. Has since plateaued. Barnett: Even after missing most of his second season with a shoulder injury, he looks like a long-time NFL starter. By far, the best players are from the "trade up" group, and it's not even close. So what will the Eagles do this year? A season ago, the Eagles were sitting at pick No. 32, where many (self included) believe that there isn't much of a difference between the player you can get there, and the caliber of player you can get in the 40's. With a dearth of draft picks and the need for more cheap players playing on their rookie deals, we projected that the Eagles would try to trade back and acquire more picks, which they successfully did, while landing a player in Goedert, who many projected as a first-round talent. The Eagles are currently slated to pick 25th in the 2019 NFL Draft. While their need for cheap talent remains, I believe the Eagles will be looking for an impact player in the first round. "When we look back and we look at our drafts, specifically looking at where we were in the 20's, we've had some good success at 20 and higher," said Howie Roseman, speaking at the 2017 Senior Bowl, an offseason in which the Eagles held the 14th overall pick. "I think there is a line where you don't get a difference maker. This is your opportunity, in the first round of the draft, to find a difference-making player. That's our first priority, is bringing in a difference maker to the Philadelphia Eagles. "By trading back and getting extra picks, but not having somebody who can affect the game... I mean, you're watching these championship games, and you're seeing that there are difference makers making big plays in these games, so we need to make sure that we come out of (the draft) with that." The question for the 2019 NFL Draft is, where is the line between the impact players, and the dropoff? While the 2019 NFL Draft is thought to be a very deep and talented one, especially at a major position of need (the defensive line), my sense is that Roseman will still want to get up into the teens from the Eagles' spot at pick No. 25. The disastrous 2014 draft in which Eagles targets flew off the board before the Birds eventually settled on trading back and drafting Marcus Smith no doubt was a lesson learned for Roseman. Unlike last year, Roseman will have the ammo to move up, as the Eagles are projected to have nine picks in the 2019 NFL Draft, and likely to have a bunch of extra compensatory picks in 2020 as well. I expect the Eagles to be aggressive on Day 1 of the draft.